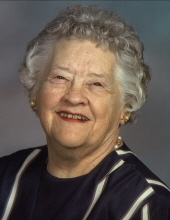 Lucille E. Thierer, 91, of Cedar Falls, died Monday, April 8, at the Western Home Communities. She was born August 29, 1927, in Jesup, the daughter of Earl and Julia Gates Parker. She married Robert Hagerman. He later died. She then married Earl Thierer in Waterloo, July of 1956. He died March 19, 1988. Lucille was a homemaker. She was a longtime member of United Presbyterian Church in Traer and the Buckingham Homemakers. Survived by: two sons, David (Nina) Thierer of Fort Wayne, Ind., and Gary (Rosie) Thierer of Mitchellville; two daughters, Linda (Dennis Colsch) Berry of Waterloo and Mary Ann Thierer of Apply Valley, Min. ; four grandchildren, Laura Thierer, John (Liz) Thierer, Bob (Julia Warren) Berry, and Megan (Kyle) LaBarge; and two great-grandchildren, Landon and Kenley LaBarge. Preceded in death by: five brothers, Lawrence, Clarence, Ray, Lyle, and Orville Parker. Funeral Service: 10:30 Friday, April 12, at First United Methodist Church in Cedar Falls with burial in Buckingham Cemetery in Traer. Public visitation will be 4-7:00 p.m. Thursday, April 11, at Hagarty-Waychoff-Grarup Funeral Service on West Ridgeway and for an hour before services at the church. She enjoyed her grandchildren, great-grandchildren, her family, family fishing trips with friends, her flower garden, and golfing. To send flowers or a remembrance gift to the family of Lucille Evelyn Thierer, please visit our Tribute Store. "Email Address" would like to share the life celebration of Lucille Evelyn Thierer. Click on the "link" to go to share a favorite memory or leave a condolence message for the family.